The Jane Phillips Award is a memorial to Jane Phillips (1957 – 2011) Mission Gallery’s first Director. Launched at Mission Gallery in 2011, the award is intended as a legacy to Jane’s passion for mentoring and nurturing talent, consistently supporting emerging and early career artists across the Visual and Applied Arts in Wales and beyond in a variety of different ways. As part of the Award, a Graduate Residency is offered where a selected artist will have the opportunity to make use of the Jane Phillips Award Studio at Elysium High Street studios. For this year’s opportunity we have partnered with the BEEP Painting Prize, to offer a painter from either Swansea College of Art or Carmarthen School of Art & Design this opportunity, with the winner selected by both Jonathan Powell, founder of Beep and the Director of Elysium Gallery, Swansea and the Jane Phillips Award Committee. 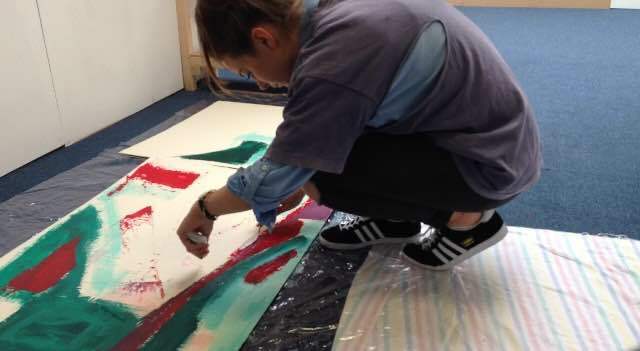 We are happy to announce the recipient as Phoebe Phillips, a Fine Art: Painting, Drawing and Printmaking graduate from Carmarthen School of Art & Design. Along with the residency, Phoebe will also receive a £250 bursary from the Jane Phillips Award to help with travel costs, as well as use of the Is This/This Is space within Elysium High Street studios, during the last few weeks of the residency. Home is the documentation of a series of walks undertaken by the artist in various cities throughout the UK presented as an installation in Mission Gallery. Tobin internally maps each city, making use of the quirks in the city’s architecture to help her to record her journey and successfully navigate each place. The walks are part of a familiarisation process, a way of ‘learning’ the city. Visiting and revisiting these cities imbues each one with feelings of nostalgia. Having lived in Ireland all her life before moving to the UK 4 years ago, Home represents the artist’s desire to recreate a sense of belonging to a place. During her residency Tobin plotted her journeys on maps using the key points that have helped her identify the city.